Shrimp and grits served up at the PigTale Restaurant in Nashua. IN THE KITCHEN When buddies Rob Jean and Chris Normandine opened PigTale in Nashua, they knew they wanted to take advantage of local meat and vegetables. “We built our menu around local farms and change the menu every week or so depending on what is available,” Normandine said. Among the local ingredients are pork from Blood Farm in Groton, Mass., produce from Lull Farm, and wines from Fulchino Vineyard, both in neighboring Hollis, N.H. The restaurant is at the former site of Crush Pizza and takes full advantage of the eatery’s wood-fired oven. Normandine handles the front of the house; Jean is the chef. THE LOCALE The restaurant on busy Amherst Street has a roadhouse feel. The bar is walled with corrugated metal and vintage license plates. Pitchforks hang on the walls. Wood and ceramic pigs lurks in many nooks and crannies. ON THE MENU You need to pig out at this cozy, creative eatery. It’s about pork, modern southern cooking, and so much more. Take the appetizers/small plates. No matter how much you think you can’t possibly “eat all that,” you can and you should add them to your meal, or make them a meal themselves. Over the course of a few visits, we tried the deviled eggs ($7), pig skins ($11), oysters ($7), and wings ($12). All superb. While deviled eggs are very retro, the restaurant puts a modern and porcine twist on their version: The creamy stuffed orbs are topped with crispy guanciale (cheek bacon) and serrano chilies on a bed of dressed greens. Awesome. And so are the wings, which are dusted with a Memphis rub, wood fired, and served with a tangy remoulade on the side. And yes, you’ll have room for your entrees. The appetizers are a reasonable size and there are always to-go containers. But that wasn’t necessary when we dug into our shrimp and grits ($21). We ate every bit and came back the following week for more. This is really PigTale’s signature plate. 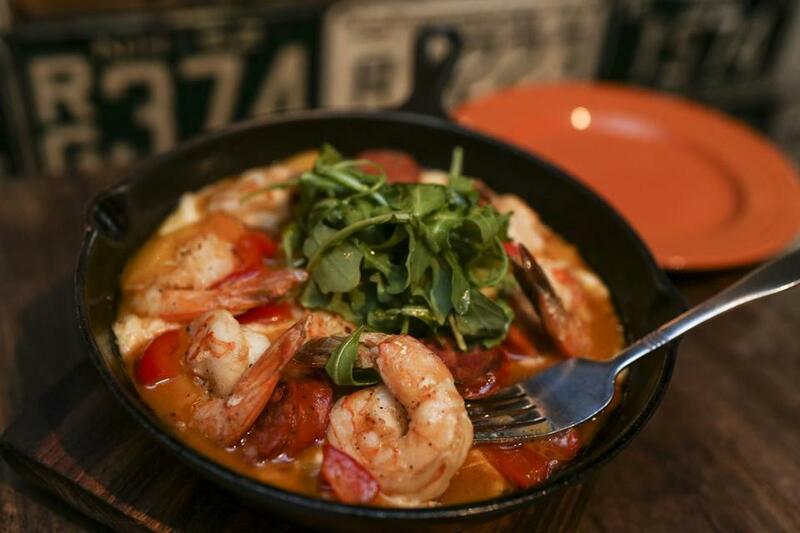 The dozen juicy shrimp are served in a cast-iron frying pan, over a bed of creamy grits flavored with andouille sausage, sweet and hot peppers, and seasoning that creates deep, intense flavors. Equally stellar was the hanger steak ($22), a perfectly grilled skirt steak, gold potatoes, charred onion, poblano chilies, and a knockout chimichurri on top. The umami quotient on this dish was off the map and was really brought to the surface by the fresh herbs in the chimichurri. During lunch time, PigTale offers salads, small plates, pizza, and sandwiches, like the “00” sandwich ($12), named for the fineness of the flour used to make the wood-fired pizza dough wrap that envelops grilled chicken, raw baby spinach, and sweet-and-sour pickled onions with a cilantro lemon yogurt drizzle. On Soulful Sundays, the restaurant adds brunch items to the menu. The chicken and waffles ($15) is an outstanding choice. The pickiest eater in our party raved about the golden, crispy buttermilk waffles, topped with cranberry preserves and southern fried, locally sourced chicken with a side of New Hampshire maple syrup. The upside French toast ($14) with caramelized local peaches, whipped mascarpone, and New Hampshire maple syrup, and the pig trotter hash ($12) made with smoked trotter, crispy potato, and two sunny-side up eggs, are two other great brunch choices. If you have room — and we suggest you make some — try PigTale’s dessert of the day ($8). In our case, that was fried dough, fresh warmed apple slices with a to-die-for cinnamon caramel sauce, and fresh whipped cream. PigTale, 449 Amherst St., Nashua. 603-864-8740, pigtalepizza.com. Tom Long may be reached at tomflong918@gmail.com.